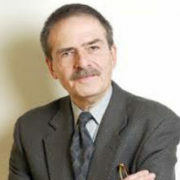 Ted C. Fishman is a veteran journalist, essayist and former member and trader of the Chicago Mercantile Exchange. His talks reflect the intelligently researched material found in his writing and have most recently focused on the emergence of China and its impact on the lives of Americans as consumers, workers, managers, and citizens. Fishman’s presentations combine engaging storytelling with a wide ranging knowledge about the world economy, putting his audiences’ top concerns into context and exploring how they relate to big, global economic trends. Fishman’s style is lively and stimulating, and question and answer periods are inevitably engaging. 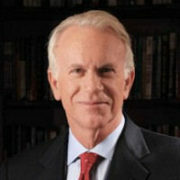 He is an accomplished public speaker who has addressed international audiences of all sizes. His talks reflect the intelligence readers find in his writing and have most recently focused on the emergence of China and its impact on the lives of Americans as consumers, workers, managers, and citizens. Fishman’s presentations combine engaging storytelling with a wide ranging knowledge about the world economy, putting his audiences’ top concerns into context and exploring how they relate to big, global economic trends. His style is lively and stimulating, and question and answer periods are inevitably engaging. His latest book, Shock of Gray, The Aging of the World’s Population and How it Pits Young Against Old, Child Against Parent, Worker Against Boss, Company Against Rival, and Nation Against Nation (Scribner Books, October 2010) looks at how the aging of the world is propelling globalization, redefining nearly every important relationship we have and changing life for everyone, young and old. Shock of Gray is rich in stories, drawn from North America, Europe and East and Southeast Asia. It also offers a clear-eyed view and analysis on where the older world is heading and what it means for all of us. 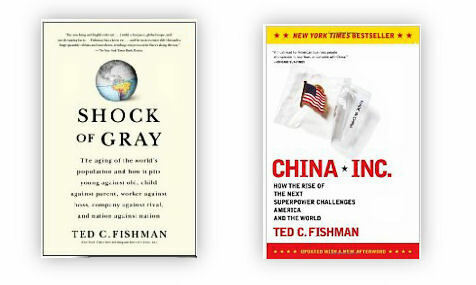 In Fishman’s previous book, the international bestseller, China, Inc.: How the Rise of the Next Superpower Challenges America and the World, he describes the effects of China’s recent emergence as a world power on the lives and businesses of people across the globe. No country–since the rise of the United States–has ever challenged the rest of the world on so many fronts as the rise of China does today. Ted Fishman explores the dynamic behind China’s rise and how the vast changes in that country change life for the rest of us as workers, managers, consumers, citizens and even as parents. In the wake of the global financial crisis, China has embarked on the most ambition stimulus plan and infrastructure building effort in the world. It is also vastly expanding it education system so help push the nation and its people to the top of world economy. The stakes are enormously high for people everywhere, and nothing about China’s continual rise is assured. Fishman explores the fundamental drivers of China’s push and what the rest of the world must do to insure that China’s drive creates prosperity at home, in the United States or wherever home may be. With urgency, humor and insight, Fishman brings China’s next stage vividly home. Two remarkable, recent facts separate our age from every other. Nearly everywhere in the world families are shrinking dramatically in size and people are living longer than ever before. Through story, statistics and keen analysis, Ted Fishman makes a powerful case that these two historic changes lie at the heart of nearly every major social and economic trend today, driving globalization and propelling the movement of money, goods and people. The average age of people in the industrialized world is climbing, and worldwide the population over 55 is vastly expanding. The populations of many countries at the heart of the world economy are shrinking. Workforces in Europe and East Asia will shrink by hundreds of millions of workers, and spur vast waves of immigration. Even the world economic crisis is inseparable from the big demographic shift. Understanding this immense, unprecedented change is essential to the stewardship of companies, organizations and communities that aim to endure and thrive. Fishman has traveled our grayer future and found what’s bright, what’s stormy, and has created a map we all will need to navigate a great change. . Smaller places can thrive in the global economy if they harness their best assets: strong community, committed boosters and close-knit networks. Ted Fishman whose book, China, Inc., describes the effects of changes in the world’s most populous country on people everywhere, explores how smaller places are uniquely poised to profit as the needs of large economies propel globalization. Fishman matches the strengths of smaller places with the needs of the world’s biggest economic actors. While not all small places thrive, nearly all of the world’s richest places (per capita) are small-scale places, and nearly all of the world’s most globalized economies, with highest skilled professional workforces are also small places. Fishman’s talks build on interviews and research into the economy of his local audiences. He provides insights that can serve, among others, communities, local economic development bodies, workforce boards, educational institutions, chambers of commerce and local industries looking to provide thought leadership in their communities. Ted C. Fishman’s best-selling book China, Inc., How the Rise of the Next Superpower Challenges America and the World, has helped describe for the world the effects of China’s momentous change on the lives and businesses of people everywhere. In addition to its success in America, the book, translated and published in 24 languages, is an international best seller. CNN International called China, Inc. “the bible on the changes in modern China.” There are Chinese editions in both The People’s Republic and Taiwan, where the book has gained an enthusiastic following. Fishman’s writing is noted for taking seemingly vastly complex topics and making them understandable and meaningful for a general audience. Fishman is particularly interested in how big global economic trends bear on people’s everyday experience. 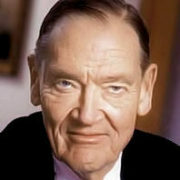 His essays and reports appear in many of the world’s most prominent journals, including The New York Times Magazine, USA Today, National Geographic, Harper’s, INC and The Times of London, among many others. (Fishman’s humorous writing has appeared in Esquire and The National Lampoon.) 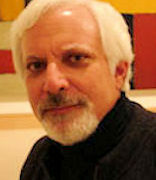 His commentaries have been featured on Public Radio International’s This American Life and American Public Media’s Marketplace. He has been featured on ABC World News Tonight, TODAY, PBS NewsHour, CNN, Fox, NPR and the BBC. 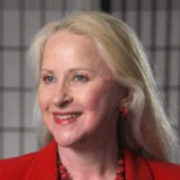 Fishman has testified before Senate and Congressional committees and commissions and consults on both China and global demographic change with a wide range of government officials, including some of America’s and the world’s most influential office holders. As a public speaker, Fishman is lively, stimulating and entertaining. 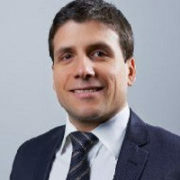 He addresses a wide range of audiences around the world, including corporate and trade gatherings, top tier financial firms, philanthropies, economic development agencies, large civic gatherings and universities. His presentations combine engaging story telling with a wide ranging knowledge about the world economy, putting into context his audiences’ top concerns and exploring how they relate to big, global economic trends. Audiences praise him for his knowledge, wit and down to earth style. Clients laud Fishman for the enthusiasm he has for learning about their organization’s and incorporating their concerns into his talks. Question and answer periods are inevitably engaging. A former floor trader and member of the Chicago Mercantile Exchange, he ran his own futures and options trading firm. 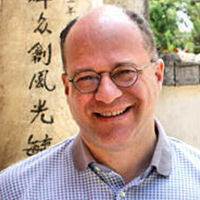 Fishman is a graduate of Princeton and has been a Visiting Scholar at Stanford University. 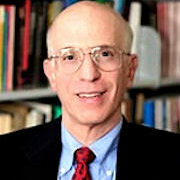 Fishman also served a faculty director at The Tuck School of Business at Dartmouth College, for which he has helped run immersive programs on China for global executives. He has lived and worked in Japan and Indonesia. Fishman lives in his hometown, Chicago.